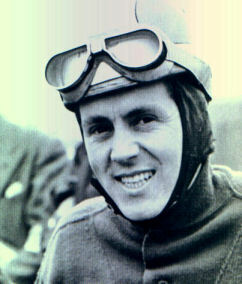 Lancashire born Geoff Duke came to prominence after winning the 1949 Senior Clubmans TT and the Senior Manx Grand Prix. He was snapped up for the Norton works team for the 1950 TT, finishing second in the Junior and shattering the lap and race records on winning the Senior! He took three more victories for Norton before changing to Gilera in 1953. In 1955 he won the Senior, and was declared the first rider to lap at 100mph, but this was corrected two laps later to 99.97mph. His final race was the 1959 Junior when he finished fourth on a Norton. Duke, a six-times TT winner and six-times World Champion took the sport to a whole new level with his professionalism. He was the first rider to wear revolutionary one-piece leathers, was crowned Sportsman of the Year in 1951, awarded the RAC Seagrave Trophy and, in recognition of his services to motorcycling, was awarded the O.B.E. in 1953. At the start of his motorcycle racing career, Duke was unable to challenge the AJS Porcupine 500 and Velocette 350 of his competitors on his outdated Norton International. The McCandless brothers designed a new frame for Norton, the Featherbed, and it was a vastly superior machine. All that was needed was a rider to make the most of it. In 1950, the 500cc World Champion was the Italian Umberto Masetti on a Gilera. The next year Geoff Duke won both the 350 cc and 500 cc classes. This was due partly to the excellence of the new Norton frame, but above all to Duke's extraordinary skill and his ability to adapt his riding style to the single-cylinder machine. In 1952, Masetti triumphed in the 500 cc category on his powerful Gilera, while Duke made the 350 cc class his own. The smaller categpries were dopminated until the end of the 1905s by the Italians Bruno Ruffo - who won titles riding Mondial (125 cc) and Guzzi (250 cc) machines - and Carlo Ubbiali. Geoff Duke aroused further passions when he betrayed Norton and switched to its greatest rival, Gilera in 1953. The englishman then won three consecutive 500 cc Championships on the sophisticated four-cylinder Gilera with twin overhead camsgafts, thus consummating his treason.